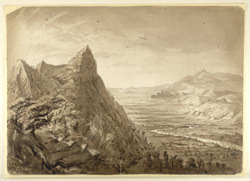 Wash drawing of a view of the Myit-nge or Little River and part of the valley of the Irrawaddy from the mountain called Mya-liet in Myanmar (Burma) by Thomas Oldham (1816-1878) and dated 9th October 1855. This image, part of Sir Henry Yule's collection, is the original drawing for Plate 24 of Yule's 'A Narrative of the mission sent by the Governor-General of India to the court of Ava in 1855' and published in London in 1858. Oldham and two companions, Yule and Dr. Forsyth, set out for the Mya-liet mountain range but only Oldham carried on to the summit of the ridge. He described the view as follows: "On reaching the top, nothing was to be seen to the west but the long gorge and gap in the hill-side, densely clothed with small timber. To the north the eye ranged over the great plain of the Irawadi, with a few isolated hills starting out in the midst like islands in a great sea: and in the foreground the great peak of Mya-liet, said to be called Pya-goon, rose with its steep side and broken outline in noble contrast to the flats beyond. Eastward the eye ranged over a succession of hills rising with long slopes, and smooth and very curiously unbroken outline, one above the other. The gorge of the Myit-nge was at our feet, with its ruddy stream flowing tranquilly between its dark and well-wooded banks."